Dale Evans was on the verge of quitting boxing – now he has the chance to rip the British and Commonwealth Welterweight titles from Sam Eggington when they clash at the Barclaycard Arena in Birmingham on Saturday night, live on Sky Sports. 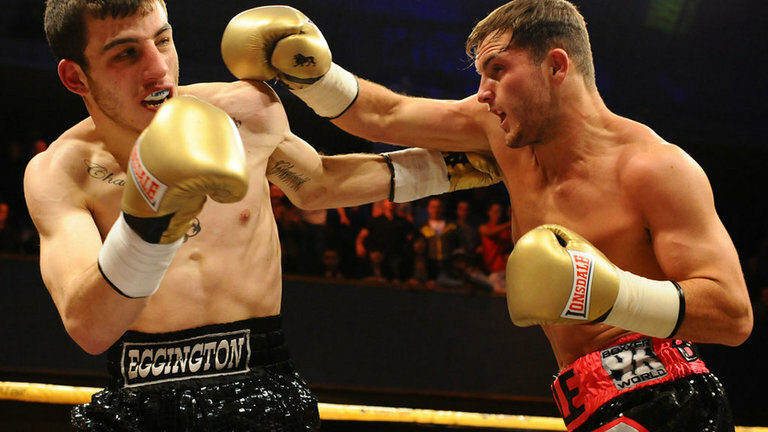 Evans holds a win over Eggington when the pair went hell for leather in the quarter finals of Prizefighter in January 2013. The Welshman was edged out of the final in Wolverhampton that night by Glenn Foot – and since then the careers of the quarter-finalists have gone in very different directions. Eggington landed a second crack at Prizefighter and another impressive showing led to a deal with Matchroom Boxing and a run of fights that saw him land the titles he defends on Saturday. For Evans, opportunities were thin on the ground, and with his demanding job coupled with a long trip to train with Gary Lockett – the 23 year old was questioning his future before the chance to replace Frankie Gavin in Saturday’s main event came up. “I was delighted when I got the call for this fight,” said Evans. “I had had such bad luck with fights over the past few months being cancelled, dates being moved and struggling to get anything. A couple of weeks before this call came I was considering knocking boxing on the head for good. I wasn’t happy anymore and I wasn’t getting anything out of it. “I wasn’t as active as I would like to be and financially I didn’t feel I was getting anything out of it. I live in Carmarthen and I train in Cardiff with Gary, which is about a 150-mile round trip that I make twice a week. I take two days off work to train and with fuel and two days’ wages cut I am spending money to try and fulfil my boxing career but I am not getting anything back when I do fight because I have been boxing on small bills. “This is a fight I couldn’t turn down, it is potentially life-changing. Gary didn’t even ask me if I wanted the fight, he knew this is what I train for and what I want. I wanted big fights to get me into this position so when it was offered to me I wasn’t going to turn it down. “A lot of people have mentioned that I have beaten Sam before. I have a lot of respect for Sam, he is a brilliant fighter and he is a nice guy. You can’t base a 12-round title fight over a three-round win in Prizefighter. He was a lot younger and he has since been in with some good opposition and finished them in style. It isn’t something I am taking confidence off because I don’t think you can relate or compare a three-round fight to a 12-round fight. Evans’ clash with Eggington is part of a huge night of action in Birmingham as Matthew Macklin returns to Super Welterweight and takes on Jason Welborn for the vacant WBC International title.